'All About Presentations' by Jazz Factory: How to add hyperlink to Smart Art? How to add hyperlink to Smart Art? But there is a way you can bypass the problem. Do you know it already? If not, then can you guess? Let us take a simple example to understand how to add hyperlink to SmartArt. 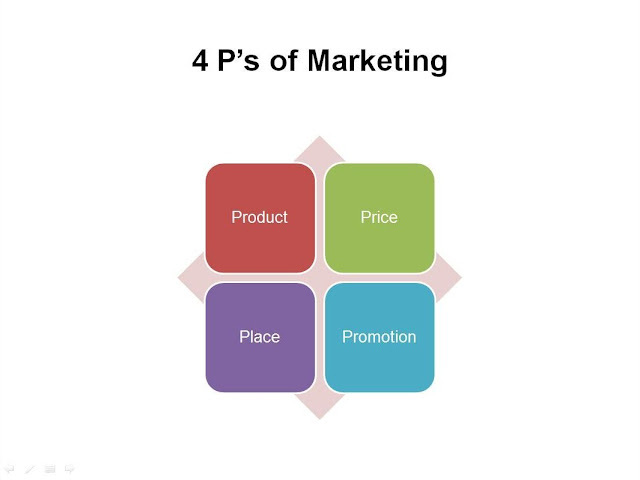 We have a slide on the 4 P's of marketing. You need hyperlinks so that when in slideshow mode, you click on 'Product' you land on the slide which talks about product. Suppose you want to go to Slide No. 8. 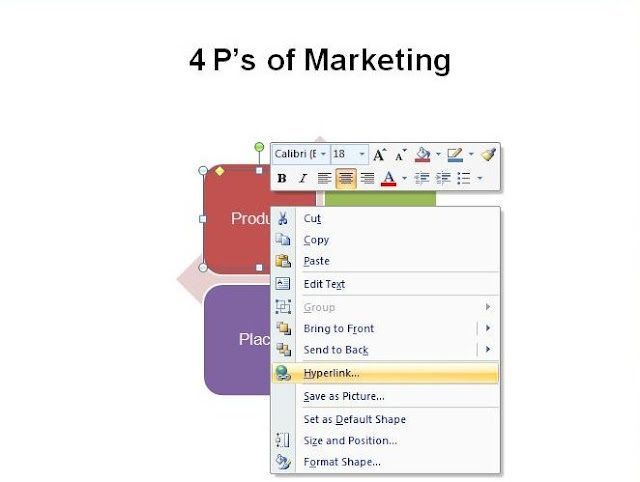 Here are the simple steps we will use to create the hyperlink:Step 1: On the 4P's slide, insert another shape. A rounded rectangle (matching the shape of the Product box). Place the new shape over the existing one (need not match it perfectly). Step 2: Format the newly placed shape -> White fill -> Set transparency to 100% -> Remove lines. You now have a completely transparent shape over your 'Product' SmartArt box. Step 3: We will now create a hyperlink on this transparent shape. Right click -> Hyperlink -> Choose the slide 8. 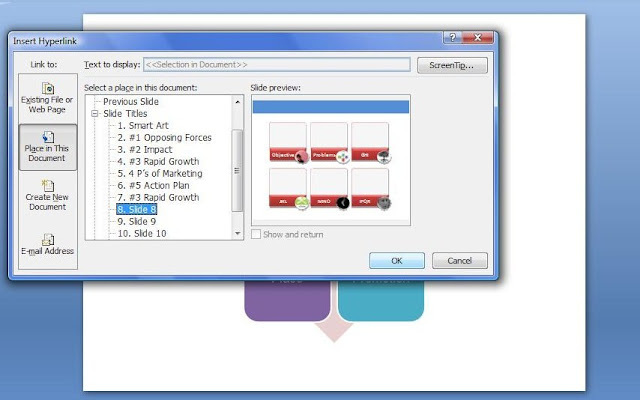 Choose it from 'Place in this document' because your slide is in the same PPT file. Your hyperlink is now ready!If you know of any other easier way of adding hyperlinks to SmartArt do leave a comment. Found another way to put hyperlinks ... when you click on any SmartArt there is this text window that opens up ... this allows you to change the text that would appear in the shapes of the SmartArt. You can highlight a particular text and go to 'Insert' and then 'Hyperlink'. Tried in a few shapes ... should work. Btw, which is your favorite SmartArt graphic? I like the 'Vertical Box List' under the 'List' heading (last column, first row). It is simple and at the same time one can put the headings (clearly visible) as well as 2-3 bullets below each heading. That's a good design. 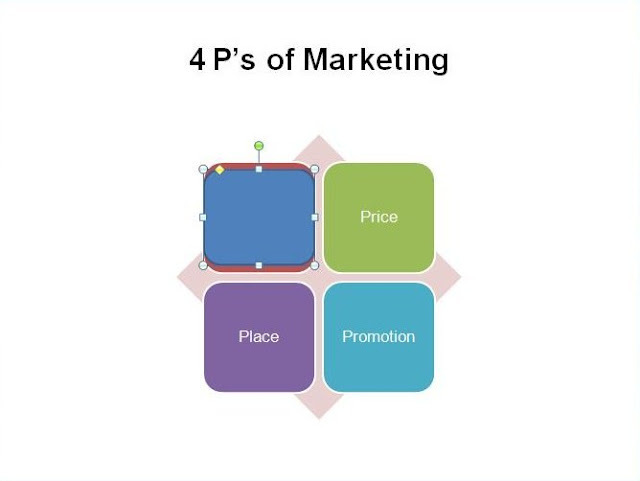 Do you use SmartArt in every presentation? Hey ... I won't say in every presentation ... but there is an urge to, for it seems so easy to give structure to individual slides through SmartArt ... guess we have to be careful not to force fit graphics. How about you? Do you use them frequently? Thanks Jon for pointing this out. I too checked and found out that right clicking on the text and creating a hyperlink does not work. Whereas it works for other SmartArt types. I suggest you use the technique mentioned in this post. 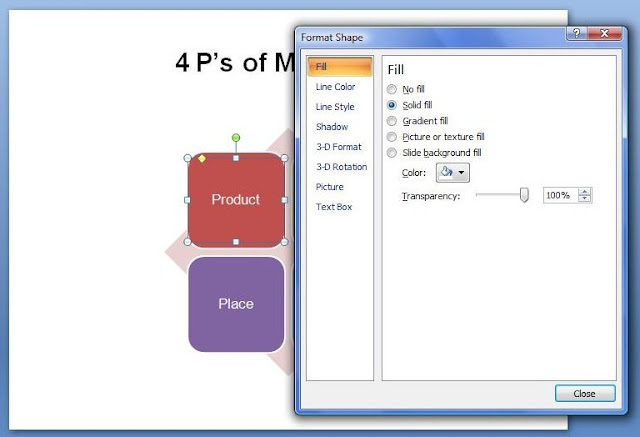 Create a fully transparent box above the text and create hyperlink using it. That never fails. I've added hyperlinks to the text in SmartArt objects, but the color is set and can't be changed, and once you click on it the link color changes to something else and remains. Is there an easy way to set/change this other than defining another color scheme? There IS a solution to this problem in PowerPoint. (In 2007) Go to Design Tab -> Themes -> Colours -> Create New Theme Colours -> The last two options are 'Hyperlink' & 'Followed Hyperlink'. You can go and choose what colour should your Hyperlink have and what colour it should have after you have clicked it. Try it out and let me know if it worked. (In 2003) Go to Format -> Slide Design -> Colour Schemes -> Edit Colour Schemes -> Custom -> Under Scheme colours choose Accent & Hyperlink -> Change colour -> Apply. Similar process for Accent & followed Hyperlink. Are you talking about hyper link in SmartArt in MS Excel? Insert SmartArt. Assume you have 3 rectangles in a process flow diagram. Type the text in a rectangle. Select the text and right click. Choose Hyperlink and insert. 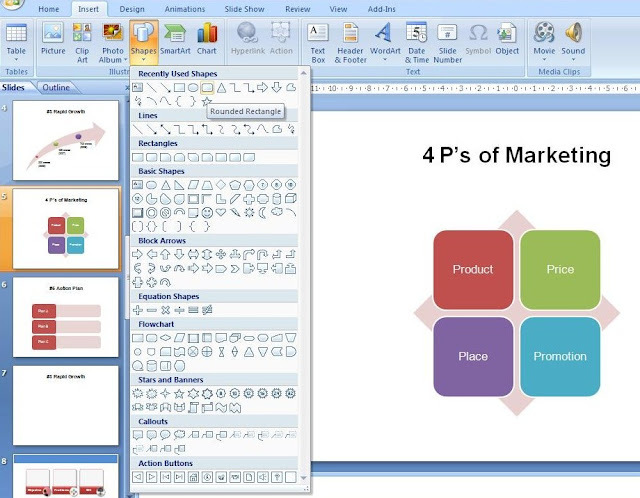 My smart art objects do not fully appear(only the first half) while on slide show, on ms office 2013 preview version. Other rhan this everything works well. Can u help me? I do not have 2013 version. So I asked a fellow blogger, Ellen. She is using 2013 and has not faced this problem. Nothing much we can do about your problem.